The Mid-Sleep time is halfway between falling asleep and waking up. 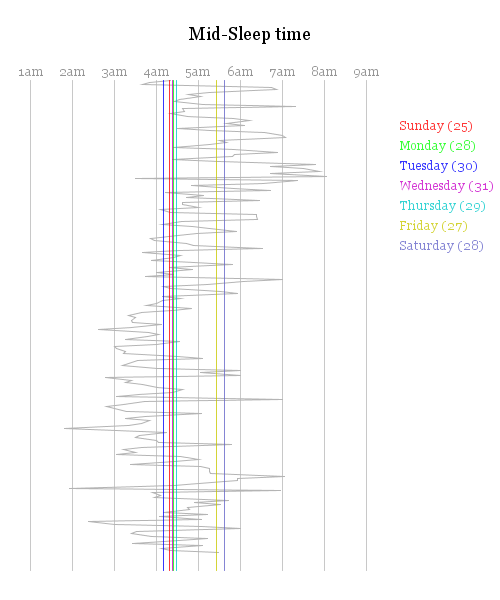 The graph shows my mid-sleep times for a period of 255 days (i excluded obvious jetlag-days) in grey, and displays the average mid-sleep values for the individual weekdays in color. Weekends obviously haver later mid-sleep points. This is an extension of Adventures in Sleeping, and presents more graphs analyzing my sleep data acquired with the Zeo Sleep Manager. Some of the graphs have already been generated with the help of my ZeoLibrary. 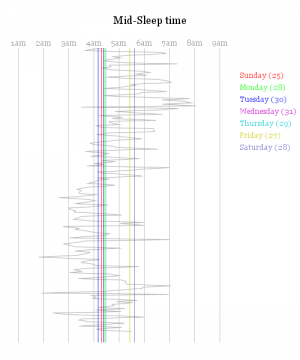 My sleep cycle time averaged over the course of the night, separated into groups for each weekday. My sleep cycle time averaged over the course of the night, separated into groups based on sleep-onset time. My sleep cycle time averaged over the course of the night, separated into groups of 50 consecutive days. Here i am mapping the mean temperature of the day (for Montreal) against the time spent in deep sleep. Very obviously there is a correlation. Heat exhausts the body and it needs more repair time (deep sleep). 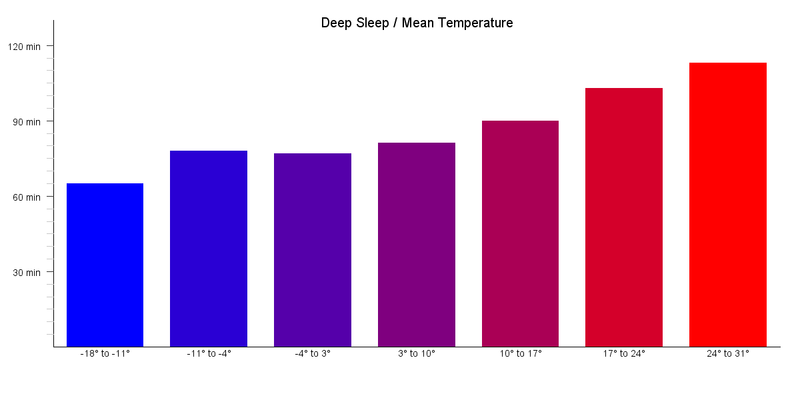 Posted in Research and tagged 2012, data visualization, sleep, zeo, zeolibrary.